Dr. Agard is a former director of medical physics at Flower Hospital Oncology Center, Ohio. He holds a B.S. (Hons) first class in physics from the University of London, an M.S. in physics from the Middlesex Hospital Medical School at the University of London, and a Ph.D. in physics from the University of Toronto. In 1993 Dr. Agard was elected to the national board of directors of the Health Physics Society. 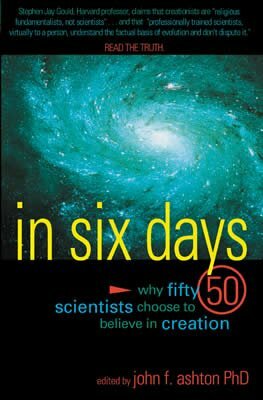 My belief in the supernatural creation of this world in six days is summarized largely in the following points: the theory of evolution is not as scientifically sound as many people believe. In particular, the problem of the origin of life is well stated by the question, “Which came first, the chicken or the egg?” Every egg anyone has ever seen was laid by a chicken and every chicken was hatched from an egg. Hence, the first chicken or first egg which appeared on the scene in any other way would be unnatural, to say the least. The natural laws under which scientists work are adequate for explaining how the world functions, but are inadequate to explain its origin, just as the tools which service an automobile are inadequate for its manufacture. The fossil record has failed to produce the intermediate forms of life required by evolution as transitions between the species. From my reading I understand that the fossil record has failed to produce the intermediate forms of life required by evolution as transitions between the species. Another problem, as I see it, for the noncreationist is the first law of thermodynamics which affirms the natural process of energy conservation. Energy cannot be created or destroyed by natural processes, but can only be converted from one form to another. Since matter is a form of energy (E=mc2 as stated by Einstein), natural sciences cannot account for the total energy, including matter, in the universe. This law consequently implies a role for the supernatural in the origin of the total energy in the universe. Furthermore, any effort to validate evolution scientifically must involve extrapolation, since current observations must be used to deduce the course of events which occurred several millennia ago (even thousands or millions of millennia). While extrapolation is a valid scientific procedure, it is pertinent to be aware of its limitations. Where there is a sound scientific basis for its use, confidence in the accuracy of an extrapolated result is dependent on the proximity of the point or region of interest to the region of observations. These issues seriously question the scientific basis of evolution. G. Tyler Miller, Energetics, Kinetics and Life: An Ecological Approach, Wadsworth Pub. Co., Belmont, CA, p. 233, 1971.